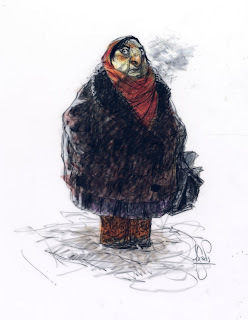 A Sketchy Past, The Art of Peter de Sève: Paris! There is a charming little gallery in Paris on Isle St. Louis called Galerie Arludik which is run by an equally charming and improbably nice couple named Jean-Jacques and Diane Launier. As a gallery that promotes and sells artwork done for both print and film, Arludik has succeeded where many have failed. This success is almost certainly a direct result of the passion that JJ and Diane share for illustration and art in general, but also because of the respect and support they demonstrate for every artist whose work they exhibit. 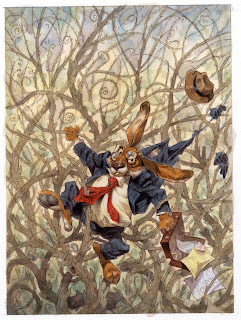 In just a few weeks, I will have the honor of a one man show at Arludik and am eagerly looking forward to it. 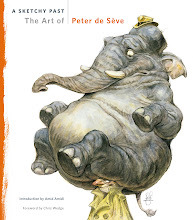 Opening night will serve the double purpose of launching the exhibit itself and also to officially release a monograph of my work- A Sketchy Past, The Art of Peter de Seve. Galerie Arludik is co-publishing it with Akileos Editions. The show will open on the evening of October 15th and run until November 21st. Below are some examples, all of which will be available for purchase, should anyone be so inclined. If you happen to be wandering the streets of Paris next month, you know where to find me! very cool, Peter! Would love to purchase one of your artwork one day :) All the best. Your work has such an inner life to it Mr De Sève. You've inspired me for years. congratulations on your show in Paris! WoW! the city of lights! What I wouldn't give to see it in person. Beautiful stuff! 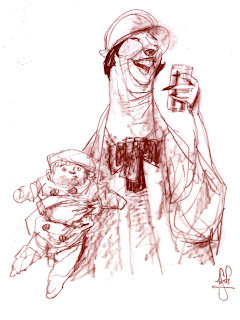 I especially love the sketch of the obviously occupied mother and the doll-like child in her arms. can't wait for your book!!! um... I think your work is a little too good. The beady-eyed woman and the fight scene are just amazing! I feel totally spoiled when I go to your blog. Every time I look at your work, I can't help but be inspired. Looking forward to when you new book comes out. Of course, your show at Arludik! If I'd known, I'd have worked out our schedule differently. As it is, we'll be in Paris on the 14th, but in Brussels the 15th. Rats - we'll miss the opening. How long will you be in Paris - you're going to be in Saint-Malo to sign your book, right? We'll be back to Paris for a few days after Saint-Malo. In any case, we'll certainly visit Arludik, but it would be great to see you there, too. So glad to see you have a blog. Now I can leave comments for you to read and pretend we know each other! But seriously, it's awesome to look here and see new work. Thanks! You hear this way to often I'm sure . . . . but your work is brilliant. I think your best work is when you're loose as in with the sketches in these posts. Beautiful work Peter! 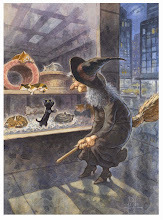 I had the pleasure of being in a show with you a couple years back at the Society of Illustrators NY. We met briefly . . . anyways, wonderful work! Love your art! The inherent movement and character of each piece is amazing, they almost feel like rough keys of an animated scene. 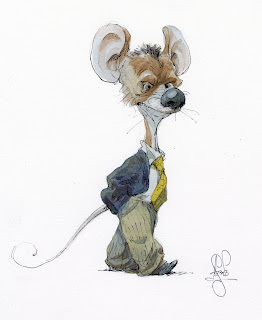 That "business mouse" is so charming! I'd hire him to work for me, for sure! I just can't imagine being so close to you and don't meet you for real ! I will manage to be there on october, 15th. It's so amazing !! I'll be there for the exhibit! Congratulations! I've been hearing amazing things about that gallery for ages and it's a great reason to visit Paris some day.I hope you can post photographs at some point.A show of your work would be incredible. 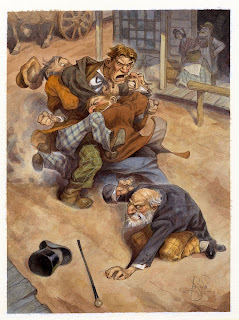 I saw some originals at the Society of Illustrators last February and they blew me away. Awesome! I can't wait to get your sketchbook! Oh how I love your artwork. When I get up every morning at 4am to draw and paint before work, I often think of your drawings to fire me up. Gonna be there!!! Finally see your wonderful art from near!! Great! !See you at the galerie in Paris!!! That fight drawing is so good! I wish I could be there to toast your work! Bravo, Peter - as always. I am going to be in PARIS for your show! !Im soo going to go!!! How exciting!!! Fantasticos trabajos, enorme soltura y concepto de volumen!